We all know who the pre-race favorites are for Sunday’s Tour of Flanders (De Ronde van Vlaanderen), headed by former winners Tom Boonen of Quick-Step, Alexander Kristoff of Katusha-Alpecin and Peter Sagan of Bora-Hansgrohe, along with the on-form Belgians Greg Van Avermaet of BMC Racing and Philippe Gilbert of Quick-Step, who have both earned two Flanders podiums. But favorites don’t always win the major classics, particularly De Ronde, which often springs a surprise. Several men have won both Flanders and Paris–Roubaix, the other cobbled monument, but famed Roubaix champions such as Sean Kelly, Francesco Moser and Jan Janssen never won Flanders but finished second a combined six times. And the past three winners at Roubaix, Niki Terpstra, John Degenkolb and Mat Hayman, have yet to win De Ronde. So the chances are that top favorites Sagan, Van Avermaet and Gilbert won’t all be standing on the podium Sunday afternoon. Instead, let’s examine some of the reasons why they won’t be. Crashes, of course, are an inevitable part of racing around the Flemish Ardennes, the low ridge of hills that contains the 18, mostly cobbled bergs the field will climb and the five sections of “flat” cobblestones it will race over on Sunday’s 260.8-kilometer course. Last year, Van Avermaet, Milan–San Remo winner Arnaud Démare and local favorite Tiesj Benoot all crashed and had to abandon the race, with Van Avermaet breaking a collarbone. In 2013, defending champion Boonen hit the deck 20 kilometers after the race start and was taken to the hospital with a heavily bruised hip; and in 2012, hot favorite Fabian Cancellara crashed out at a feed zone some 60 kilometers from the finish. And, of course, one of the Ronde’s legendary incidents, on the Koppenberg in 1987, involved the solo leader, Jesper Skibby of Denmark, who was knocked from his bike by the race director’s car, which then drove over his bike. 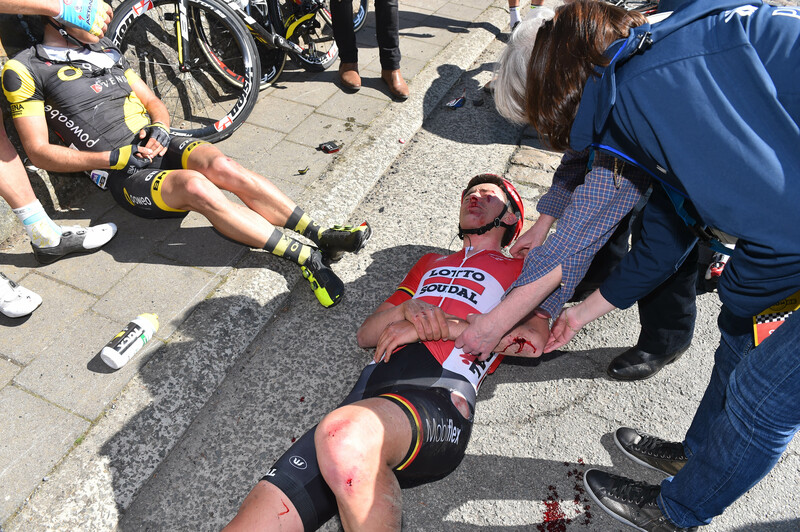 Crashes, like this one for Tiesj Benoot last year, are an ever-present danger at De Ronde. As a result of that incident, the ultra-steep Koppenberg (which will be No. 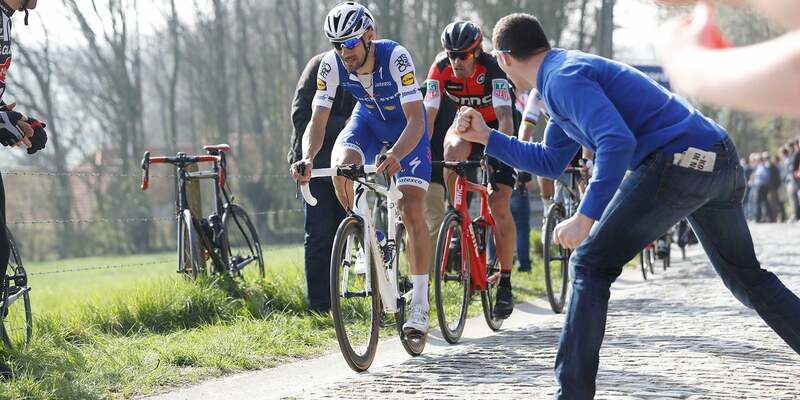 13 of this year’s 18 climbs) was excluded for 15 years and only brought back to De Ronde after the 600-meter-long hill with its 20-perecnt pitches was widened and re-paved with new cobblestones. Poor road surfaces can cause other problems, including flat tires and mechanicals, for the race favorites. Though not in the Ronde, the dirt roads featured in last week’s Ghent–Wevelgem saw two race favorites, Démare and Kristoff, get flats and the very slow arrival of service vehicles caused them to lose any hope of challenging winner Van Avermaet. Also, in last Friday’s E3 Harelbeke (also won by Van Avermaet), Sagan lost any hope of success, because of a slow response to a mechanical problem at the foot of the Paterberg—which will be the final cobbled climb this Sunday. And slower wheel changes is the main reason why riders such as Boonen are not using disc brakes this Sunday. Besides crashes and mechanicals, team tactics can also play a negative part in the outcome. 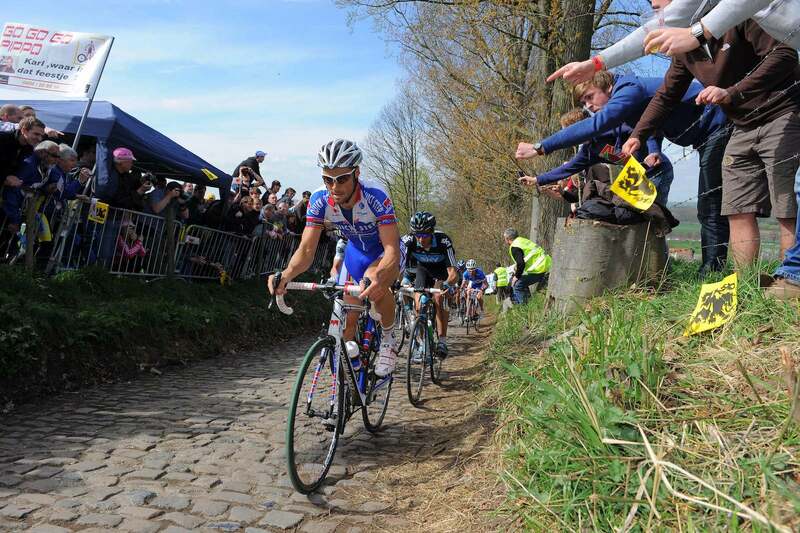 That was the case at the 2008 Flanders, for which Boonen was the out-and-out favorite. At De Ronde, Boonen had to play the part of a passive teammate when his Quick-Step colleague Stijn Devolder got into a breakaway from which he attacked solo and took the win. In a different situation, race favorite Kelly was furious at the 1984 edition when he split the lead group on the Muur and fell victim to two Panasonic team riders, Johan Lammerts and Ludo De Keulenaer. They didn’t contribute anything to the breakaway’s success before jumping away in turn, forcing Kelly to chase, until one of them went clear [Lammerts] to win. The angry Irishman easily took the sprint for second and went on to win Paris–Roubaix the following week and then the year’s third monument, Liège–Bastogne–Liège. It’s quite possible that Sagan, with no teammates strong enough to stay with him in the finale on Sunday, could be out-numbered by the powerful Quick-Step team, which, besides Boonen and Gilbert, has potential winners in Terpstra and Zdenek Stybar. And there are a host of other formations, led by Cannondale-Drapac, Lotto-Soudal, Orica-Scott, Team Sky and Trek-Segafredo, that have a legitimate chance of upsetting the favorites. Bad weather has also been a factor the has worked against the favorites in the past; but with a forecast for mostly sunny conditions and temperatures in the upper-50s Fahrenheit for Sunday afternoon, the 101st edition of De Ronde van Vlaanderen should be trouble-free—except for the crashes, flats, mechanicals and unpredictable tactics.